The development of performances in the 200 m sprint has been affected by its intermediate position between the 100 m and 400 m. All efforts to describe a statistical relationship between either the 100 m or 400 m distance with the 200 m have been unsuccessful. There are successful double-starters from both disciplines: Florence Griffith-Joyner (USA) as world record holder over 100 m and also Usain Bolt (JAM) as double Olympic champion over 100m and 200m are examples. A widespread specialisation upon this distance has possibly not occurred or not yet occurred. Two outstanding leaps in performance (Bolt 19.19s and Griffith-Joyner 21.34s) are the most obvious characteristics of the present situation and have not nearly been achieved by the majority of world class sprinters. The sprinter’s goal is to develop the highest possible horizontal velocity. As an example this velocity is developed in the 100m sprint within 43 – 46 strides (men) and 47 – 52 strides (women). A stride consists of a stance and a flight phase. The sprinter’s horizontal propulsion is only produced during the stance phase. The push-off leg (figure 1) presses against the resistance of the floor in a backward-downward direction (“action”) and the interactive forces result in the horizontal propulsion of the body in a forward-upward direction (“reaction”). The stance phase is prepared during the flight phase. It is important that all forces acting against the running direction (e.g. resisting movements) are minimized. During the flight phase the legs must actively swing downwards – backwards because from a subjective point of view it seems to the sprinter that the ground is coming towards him. The braking forces are minimized because the feet backward swinging feet and the “retreating” ground have approximately the same velocity. There is only little time available for the sprinter to develop force during the stance phase. The stance phase of the foot on the ground is only 0.08 s – 0.09 s long in the phase of maximum velocity. However, the greatest possible power must be produced in this short time for forward propulsion. Forces of up to 3.5 times the body weight in vertical direction and a single body weight in horizontal direction are acting during the stance phase. This explains the great importance of strength in sprinting which is comprised predominantly of maximum strength and speed strength. However, stronger legs must also have a correspondingly strong upper body because (according to biomechanical laws) the swinging arms must produce equal opposite forces to the those of the legs. This explains the generally very strong appearance of sprinters. The sprinting velocity is mathematically determined by the product of stride length and stride rate. These two factors interact: after they have reached a certain level after a phase of mutually increasing (in the first 50 m) an increase in either parameter will result in a corresponding decrease of the other, i.e. if the sprinter increases his stride length after 50 m then the stride rate must decrease and vice versa. The extent of these changes varies individually depending upon physical capabilities, training level, form of training and body build. 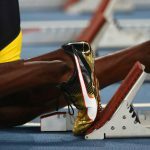 According to international rule the shoes worn in sprinting can have spikes up to 9 mm long. As the sprinters run on the balls of their feet, the spikes located underneath this part of the foot permit a more efficient transfer of force to the track. The foot can not have much room to move inside the very light shoe (no socks). The transfer of force to the track is more effective the thinner and harder the sole is so that the feeling for the direct contact with the track is improved. The track itself has definite performance influencing characteristics. An important criterion for a “slow” or “fast” track is the level of deformation of the substrate. If the substrate is harder the sprinter can transfer his force better and therefore, gets a better propulsive reaction force. The decisive factors in evaluating a track are the thickness of the artificial surface layer, the substrate material (asphalt or concrete) and the density thereof. The features for the “fast” track in Atlanta were a 5 to 8 mm thick artificial surface layer and suggest an extremely dense asphalt. Similar construction methods have lead to similar conditions in Athens. 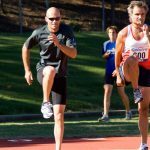 Fast but hard tracks have the disadvantage that the musculo-skeletal system is heavily loaded which often leads to overload injuries which are especially prevalent in long distance events or in training. Climatic conditions can be very significant. Tail wind always assists in the 100 m while head wind is always detrimental to performance. The 9.94 s over 100 m run by Jim Hines (USA) in Mexico in 1968 benefited from a number of climatic factors: dry and warm conditions, a reduced air resistance which corresponds to a wind assistance of approximately 1.5 m/s (Mexico-City lies at an altitude of 2,240 m) and also a tail wind of 1.6 m/s. The dimensions of the track are a width of 1.22 m and a length which can not vary internationally by more than 2 cm. 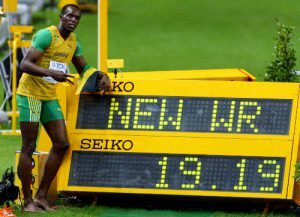 The windmeter in the 200 m sprint must measure for at least 10 s after the first runner has reached the finishing straight. A record is no longer acknowledged if a tail wind of more than 2.1 m/s is recorded. However, such a wind measurement provides no information about the wind at the start or finish and therefore, has limited meaningfulness. During the reaction phase the highly concentrated sprinter uses the resistance of the starting blocks to initially accelerate from a complete rest position. An explosive force production of the legs in a very short time is vital for a successful start. After the start signal the sprinter must develop horizontal forces reaching up to 1.5 times body weight in less than 0.4 s . The reaction time (the time between the start signal to the first movement of the sprinter) is of relatively small importance to the overall result. However, the desired psychological advantage at the beginning of the race can last right through to the finish. After leaving the starting blocks the sprinter increases his running speed in the acceleration phase by continually increasing stride length and stride rate with a clear forward lean position. During this phase men achieve stride rates of up to 4.4 strides per second, women reach 4.7 strides per second. The length of the acceleration phase increases at higher performance levels and this is the most important phase for the race performance. Top sprinters reach their maximum speed after about 60 – 70 m (men) and 50 – 60 m (women). 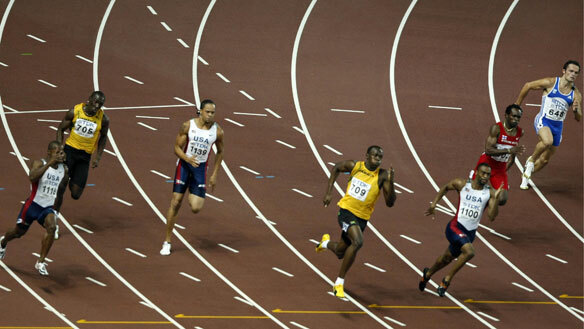 In the phase of maximum velocity (at 60 – 90 m) the sprinters cover a distance of 20 – 30 m at their highest speed. This is where the maximum speeds of 11 m/s (men) and 10 m/s (women) are achieved. Stride length and stride rate vary amongst sprinters and reach personal optimal ratios. Ground contact times decrease. The following 100 m constitute the deceleration phase. As a result of fatigue of the central nervous system and an accumulation of metabolic waste products the stride rate decreases and the sprinter attempts to compensate with increased stride length. Some sprinters appear to get faster at the end of a race which is only an illusion resulting from varying rates of fatigue. The finish is the decisive stage of the race especially with minimal differences in ability. Competition rules state that the time is based upon the trunk passing the finish line. A strong forward lean is an advantage to a sprinter. This is achieved by flexing the hips while simultaneously bringing back the arms. The forward lean can lead to forward torque which the sprinter must compensate and which occasionally leads to falls after the finish. ← What is SHIRV ?